Definition. Let S and T be sets. The Cartesian product of S and T is the set consisting of all ordered pairs , where and . Remarks. (a) is not the same as unless . 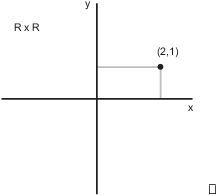 (b) You can define an ordered pair using sets. For example, the ordered pair can be defined as the set . Example. Let and . List the elements of and sketch the set. But this is not S: The elements of S are a, b, and c, whereas the elements of the subset U are pairs. Equating the first components, I get , so . But equating the second components, I get , so . This is a contradiction, so . You can take the product of more than 2 sets --- even an infinite number of sets, though I won't consider infinite products here. 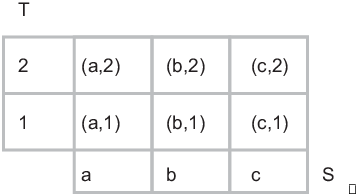 For example, consists of ordered triples , where a, b, and c are integers. This contradiction proves that .